If that is the case, then a Schulter youngster is going to have a lot of days of good luck as he battles for his life. Ayden Stites-Moore was diagnosed with a brain tumor in 2017. Since then he has undergone two surgeries now is hoping for some good news. Following the initial diagnosis, he had surgery that revealed the tumor was malignant and doctors were unable to remove it completely. A subsequent examination at St. Jude Children’s Research Hospital in Memphis found the tumor was back and larger than before. That prompted the second surgery in November. “We again followed up with St Jude in February, where we got great news, that only a small “suspicious” area remained,” said his mother, Samantha. Doctors want to monitor his progress which means trips to Memphis every three months. There is where the pennies come in. 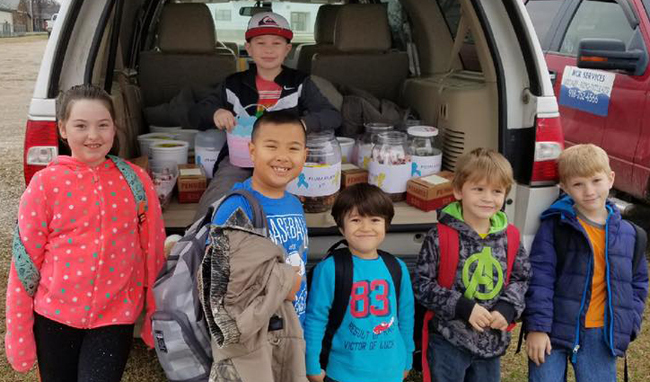 Students and staff members at Schulter held a penny war, filling up jars, buckets and boxes with copper coins to help defray the expenses for the multiple trips. She said the penny war was the latest in help the family has received from the community. All of the money raised has been put into an account to be used for any travel related expenses that are not covered by St. Jude or insurance. For now, Ayden and his family are preparing for the next trip in May and hoping that all that good luck from the pennies will bring good news.